Photo credit: Quinn the Islander. Back in 2005, King County established a ten-year plan to eliminate homelessness. Ten years later, there were approximately 2,137 more homeless people in the county. 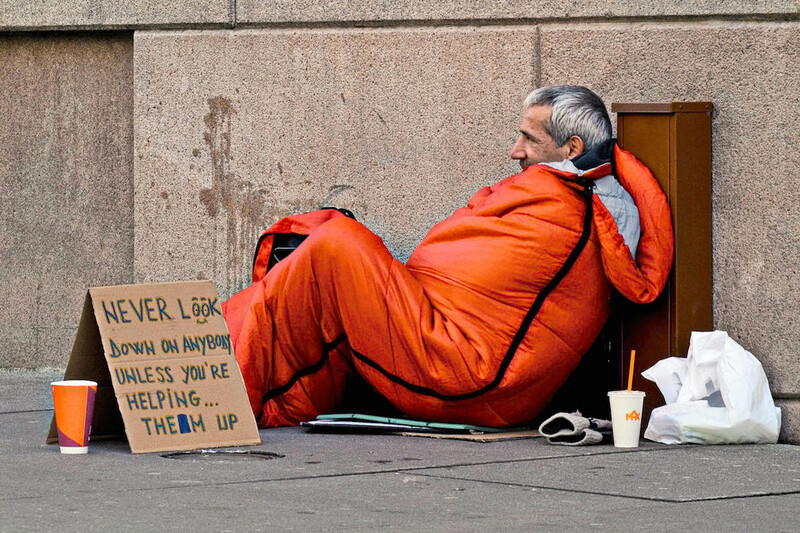 According to the Coalition on Homelessness which conducts a one-night count every year, there were 7,910 homeless residents in the county on January, 2006 and 10,047 this past January – some in shelters, some in cars, and a record 3,772 people living on the streets. Under the auspices of a group called the Committee To End Homelessness In King County (CEHKC) the ten-year plan was about as successful as a Lincoln Chafee presidential campaign. The group’s low point occurred about three years ago when an organization called Occupy The Ten Year Plan would campout at Westlake and along with its supporters march to the CEHKC meeting the next day. The occupy group protested the coalition’s emphasis on long-term housing while discounting the role of shelters and encampments. In fairness, the Ten-Year Plan had its successes. CEHKC found housing for over 60,000 people in the ten-year period. Sadly, almost 20% of that group found its way back on the streets again. CEHKC is starting up again this week but with a new name – All Homes – a new director, Mark Putnam, a new board, and what they hope will be attainable goals over the next four years. Before assuming his current position, Putnam worked for Aids Housing of Washington where he consulted cities on how to develop housing for HIV/Aids patients. He also served as president of the Board of Directors for the Roots Young Adult Homeless Shelter. Putnam brings a progressive, activist agenda to the position. He supports city sanctioned tent encampments and car campers. He even showed up in Ballard to show support in the battle against NIMBY’s (not in my neighborhood) who were against a tent city moving into that community. Recently, Putnam received the Real Change “Change Agent Of The Year” award at the homeless advocacy group’s annual breakfast. Real Change had previously been a supporter of “Occupy The Ten Year Plan,” and Founding Director Tim Harris admitted he never thought Real Change would be presenting an award to the head of the CEHKC. All Homes’ strategic plan is a more inclusive approach to tackling homelessness, not a top-down government approach. The new plan, running until 2019, still has goals, tackling veteran, family and youth homelessness. A 2013 poll shows that homelessness is created by rent increases, lack of a safety net (friends and relatives that a person can rely on ), the overall economy and the influx of people moving into a region. Also for individuals leaving jails, foster care, treatment programs and hospitals, about 20% become homeless shortly afterward. All Homes plans to partner with groups around the county that are dealing with these problems. That includes groups like the One Home Campaign, a local effort to develop new partnerships between non-profits and landlords to expand housing options for formerly homeless individuals and families. All Homes is represented by a 28-member coordinating board. While the board includes some longtime activists like Alison Eisinger of the Coalition of the Homeless and Michael Ramos from the Church Council of Greater Seattle, six members of the board have actually been homeless. A third of the members are people of color. According to the All Homes website, African Americans are five times more likely to be homeless and Native Americans, seven times more likely. Groups like All Homes won’t eliminate poverty – one Facebook commentator called the coalition “too little, too late” – but there’s definitely a place in the homeless community for All Homes. Stay tuned, to see how far the group’s enthusiasm carries them. The Executive Board meets this Wednesday, Nov. 4 at South Seattle Community College in Georgetown. On Dec. 2 a full board meeting takes place at noon to hear stories from those experiencing homelessness followed by a full meeting at 2:00.